This is a screenshot from my logos Bible app on my tablet, which I love! I am enjoying the many options in marking the text. It helps me to visually make connections that I wouldn’t see with just reading the text. 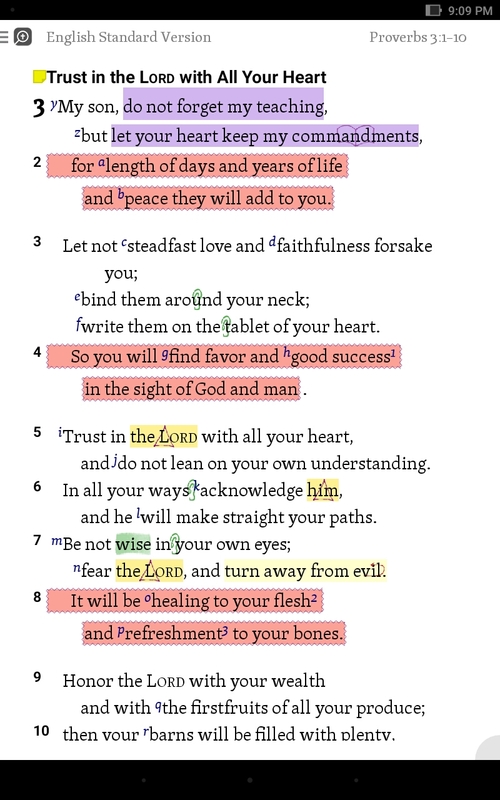 So, I marked the verses with zigzaggy orange boxes for blessings. Yes, zigzaggy is now a word. I also marked actions that we need to take. And, not surprisingly, I saw a pattern. I was able to find at least 6 prerequisites for blessings. Let’s take a look at those now. I just want to point out that it’s hard to remember something that we don’t already know. I’m sure many of you are studying the Torah portions on a weekly basis. This is a wonderful idea, and something that we do at our home as well. The next step is to focus on the actions we need to take after reading the Torah portion. We want to go beyond facts, and begin applying. A simple way to teach your children commands is to create a Torah notebook in which your children illustrate the commands. You can read more about that here. Some verses show obvious commands, like Exodus 20. At other times, you will need to look at the character’s actions and the results to learn more about commands. The important thing is to be looking, not just for information, but for what you need to be doing to obey YHVH more. Obey out of a heart’s desire, not a sense of duty. YHVH does not want people who walk around like drones, doing what he says, but not caring one way or the other. He also doesn’t want people that obey outwardly to make sure everyone sees them, but inside they are selfish and prideful. Do you see the difference? Let’s obey out of grateful hearts and a desire to please our Abba, not because we think we must, or we want other people to see. Surround yourself with reminders of the commands. There are several ways to give yourself visual reminders of YHVH’s commands. Wear tzitzits. They are a command to help us remember the commands! Love that! Here are some pretty ones my sister made. Post Scripture on your doorposts. Mezuzahs are designed to do just this. This post is full of lots more ideas, too. Play music or an audio Bible. Use copywork in your homeschool. Trust that YHVH is smarter. This is a tricky one for many of us. We are in the middle of a sticky situation, and we can’t see which way is up, but we also manage to convince ourselves that we know what is best. Trust is being able to recognize that YHVH has you in the palm of His hand. He often works slower than we think He should. Trust requires patience. But, He promises blessing for those who are willing to learn this childlike skill called trust. What can you, or should you, trust Him with today? Honor YHVH as your suzerain. Suzerain is an ancient term that basically means – King of Kings. In ancient times, kings would literally be over other kings, and the under kings would pledge their total allegiance to the Suzerain, or top king. YHVH is our suzerain, and we must follow Him alone. I highly recommend the book, King, Kingdom, Citizen: His Reign and Our Identity , to help you understand this concept better. It’s well worth the study time to fully grasp and live by this concept. How easy it is to get comfortable in the idea that I am right. But, YHVH calls us to readily admit when we are wrong. Repentance is not simply a confession, but a wholehearted effort to not repeat the offense. When we repent, we must admit the wrong, put steps in place to avoid repeating it, and replace the wrong action with something right. Many years ago, I heard a story from an ex-smoker. He always had a pack of cigarettes in his shirt pocket. When he got saved, he also decided to stop smoking. He got rid of the cigarettes, but still found himself reaching to the shirt pocket out of habit. The empty pocket made him want the cigarettes even more. So, he put a New Testament in his pocket. Every time he reached for cigarettes, he was reminded of his new relationship with God, and the cigarettes paled in comparison. It’s important to not only confess, but replace the wrong action with something good. What do you need to repent of? If you need some help to start sifting through your life, I wrote a post with a list of questions to ask yourself daily. Which prerequisite do you need to work on? This is quite a meaty list if you really look at it. I would like to encourage you to pick one of these to work on this week. Start with prayer, and asking the Father to help you in this area. Then write down some ideas where you can make some physical changes. Real changes are made one step at a time. Just take the next step. Determine that this week, you will follow YHVH closer than you did last week. Yes, He promises to bless, but if we pursue a relationship with Him first, the blessings are just gravy.